Every Event is Different- Let InJoy Make all the Difference for You! Whether it’s a Wedding, Corporate, Bar/Bat Mitzvah, or Destination, we will energize, boost, and bring the event to life! Live music is in our blood and that’s what we do best! When thinking about Music, Entertainment, and even Production, we think Joy, we think Emotion, we think Excellence! That is what standing in front of our eyes when we do our job. It’s not only giving the best performance every single time, it’s also about keeping a warm, caring, and long-lasting relationships with our clients and the quality people we work with. Click here for more of our videos. Contact us using the form below. Call or text us at 818.705.3437, or email us at injoyprod@yahoo.com. We look forward to speaking with you about your event soon! Thank you so much for an unforgettable amazing wedding. You and your band were simply phenomenal and brought an energy, warmth, and enthusiasm that filled the night with love and joy. We can’t thank you enough and hope you had as much fun as we had! a happy bride and groom! It was a great pleasure working with you. Your band was phenomenal- especially the latin singers. Everyone had a wonderful time. We looki forward to working with you again. I want to thank you so much for doing such an incredible job. I envisioned so many times what I wanted it to be like when I walked down the aisle and the way in which you sung Boee was exactly what I had imagined. Walking down the aisle was the most spectacular moment for me and one that I will never forget. The way in which you sung the song was so powerful, had so much meaning and was just absolutely beautiful. You are an amazing performer with an incredible voice, energy and enthusiasm that really gets the crowd going. What makes an unforgettable party is an unforgettable band. 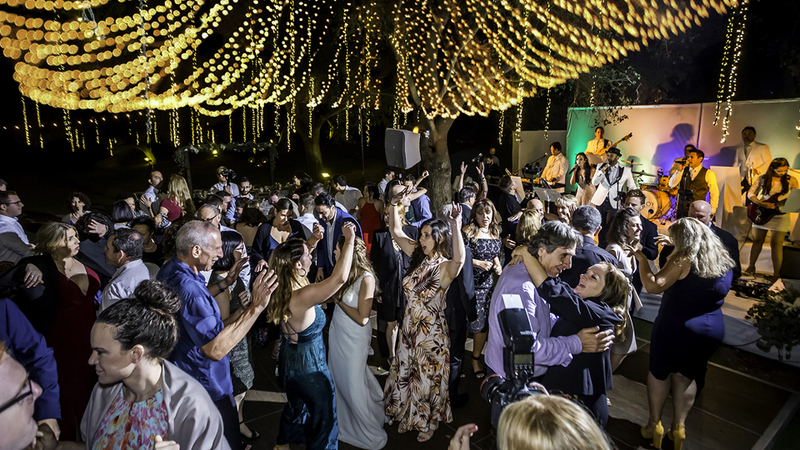 You helped us achieve our dream of a wedding reception where everyone was on the dance floor all night long! I could not get over how when I looked around at the end of the night how many people were still left. You are such a pleasure to work with- accommodation, calming and amazing at what you do. I wish you all the luck in the world! You are the best and I will miss working with you. Thank you so much for your part in the success of Dorit & Darren’s wedding day! Your music set the tone for a dream wedding and I’m sure their guests will not forget! The Legacy of the Ebell lives on because of you. Please, please join us again soon! You were amazing at our Annual Gala! People are still talking about your band and how much fun it was. Thank you for your kindness and energy. Hope to see you soon. You have been a pleasure to work with and we are so glad you were a huge part of Lauren and Charlie’s special day. I knew it will be more than a success and the most talked about wedding at Aliso Creek Inn. Your music and band are an inspiration. Thank you again for being so professional and accommodationg. Thank you for the wonderful Simcha. You can be certain that you are the only band we would recommend! You were great! Executive Director at Temple Emanuel and a happy Father of the Bride. What an AMAZING band and group of people. My wife and I will forever be grateful to have met Gilat & her band In JOY. They not only worked with us throughout the process but truly did everything they can to make our wedding memorable and it was. I 100% recommend them. They are the NEXT biggest thing you will hear regarding bands. Love you guys. Thank you. Let me just start of by saying I have been to a lot of weddings and have seen my fair share of bands. Music was my number one priority when it came to planning my wedding and when I found InJoy online, I was hesitant because I had never heard of them before. Gilat, the lead singer, arranged for us to come see them in action at another wedding. Needless to say I was sold! They were OUTSTANDING! I am still getting compliments on the band selection. They listened to all my instructions and played music that kept all my guests dancing the night away. I asked them to perform one of my favorite pop songs in a slowed down version for my first dance with my husband, and it was absolutely perfect. I can't wait to hear it again on my wedding video. 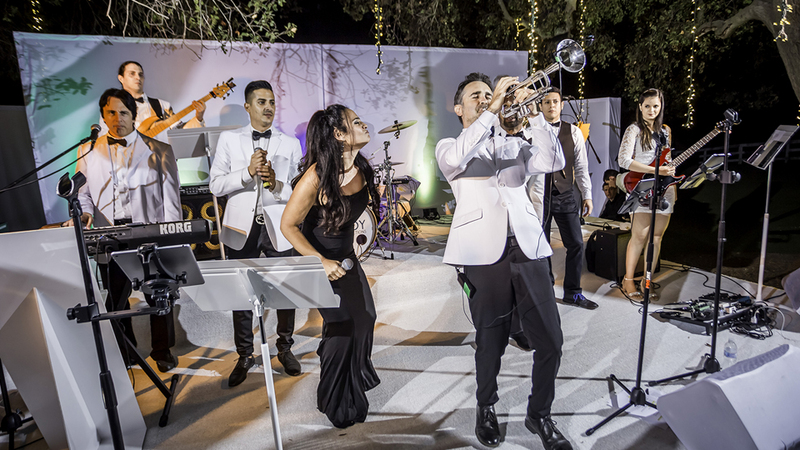 If you're looking for an awesome and talented band for your wedding look no further than InJoy! We booked Gilat and Injoy Productions for our September 2016 wedding. We met with Gilat and we knew she would be a perfect match for our event. Gilat and her team was super flexible and even learned some new music for us. It couldn't have been more perfect! Injoy is everything you expect and then some! Gilat and her musicians have a huge repertoire of pieces and they are willing to learn new material to make your experience totally personal and customizable. They sound amazing and most importantly they bring such a great energy suited to any event! Gilat and her band played at my wedding this weekend and blew our guests away. My husband and I were so happy with them! They pleased people of different ages/ backgrounds/ etc which is not an easy task to do. The dance floor was filled the entire night and everyone wanted to keep going even after the wedding was over. Gilat's personality is so warm and loving and she made us feel so comfortable from the very start.